One of the most important roles an orbiting spacecraft can play is helping identify potential landing sites for the next lander. This is a false color image of an intriguing site for the next Mars rover – the Mars Science Laboratory – a huge nuclear-powered rover that will have much more capability and range than Spirit and Opportunity. 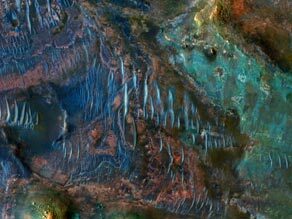 Scientists used a spectrometer on the Mars Reconnaissance Orbiter to locate this site – which is dotted with clay deposits. They then took a high resolution picture – and added some false color to make it easier to see the clay (reddish spots). Martian clay would be a cool thing to find and analyze since it is, of course, formed in the presence of water. By the way, the resolution on this image is about one foot (30 cm) per pixel – that's High-Def by Mars exploration standards – and a long way from those early faxes from Mariner! Miles – your converage of science and space is awesome – passionate... making it very real for us earth bound creatures! thank you!!! why not include a link to a hi-res version of the pic? one thing i hate about these sort of articles is the lack of relevant links, i mean, it IS the internet for gosh sakes! Thanks Lee!! You get extra points for paying close attention. Problem fixed., The extra "the" has been expunged. The extra "the" has been removed. Come back tomorrow, it's going to be awesome. by land rovers and may have an effect to earth. We'll watch this tomorrow, can't wait to see the final touchdown. I have watch the last touchdown tru cnn. GOOD LUCK. The above should be linked in the main blog. It's always disappointing to me when we have these great new, high-res pictures available and all that's on the CNN site are tiny versions we have to strain to see. Is there some reason why there can't be larger versions we can look at by merely clicking on these near-thumnail images? Thanks. I have often thought that there are so many stories that would capture America's interest if only promoted. Instead of hounding people and having freak shows like Larry King normally has, why not have CNN spend a concerted effort to engender interest in subjects like these. A serial killer or a bunch of groupies in Texas get hundreds of times the coverage as stories like this one. There are intriguing stories to be had about new energy sources, new inventions, etc., it just takes a little more homework and effort to produce–you guys at CNN got the money, do you have the will and skill? Amazing...one pixel represents 30cm in that photo....too kewl. It is only a matter of time before one these probes finds the smoking gun. With all we know about Mars the question in my mind is not if life existed there, but when? We are destroying and polluting earth and we are now going to do the same to the moon and mars , wherever a humanbeing living ,it brings only distruction. to the one who said "Imagine an Israeli and an Arab standing next to each other on Mars"
No i can NOT image that , do we need another war on mars? Follow the water is a fairly new term used after the successful landing of Opportunity and Spirit rovers. Not too long ago before the twin rovers if you said follow the water in terms of exploring Mars most scientists would have looked at you sideways. Here is a link to a read-only blog with images from Space.com message board that has some scientist still looking at us today sideways. You need to stay away from stressful subjects. Leave the complicated stuff to those of us with the capacity to function normally under challenging conditions. There's a reason you failed science class. Try knitting or solitaire. Where will we able to find Miles tonight? Is this an online showing or on the CNN Channel on TV? I want to make sure I don't miss a second of this!! I certainly believe that life exists elsewhere in the universe. But on Mars? It would have had to develop quickly within very narrow windows of opportunity and then adapt very quickly to rapidly changing, very extreme and hostile conditions. So I'm not so certain. It will be totally awesome, in both the modern and the traditional senses of that word, if we find it. But even if we don't, it is already totally awesome getting to understand the geology and weather and overall make-up and behaviour of another planet. Go NASA, go ESA! GO PHOENIX! YES!!! I hope CNN will divide their televised screen so that we can watch several different groups of scientists "watch" the 7 minute SOFT landing without ANY lame comments from/by the news folks; this will allow those of us that have taken part in prior missions to share the moment without bla bla bla. There will be plenty of time afterward for all the comments and interviews. Thanks, Miles, for your fine commentary on the Landing – Your enthusiasm and understanding of the process was impressive- BUT I'd recommend you watch (and listen) to a baseball game or two – perhaps one with commentary by Vin Scully or another master – you'd find that perhaps the most important rule to observe when covering a great moment, is knowing when BE SILENT and let the event speak for itself. It was disappointing that there were so few seconds when you were willing (perhaps because of a Network Mandate?) to let the NASA spokespeople give the final countdown, letting the drama play out, without constant commentary, on the event. Still, thanks CNN & Miles for providing us with some Martian Prime Time.